* Email chain getting too noisy? 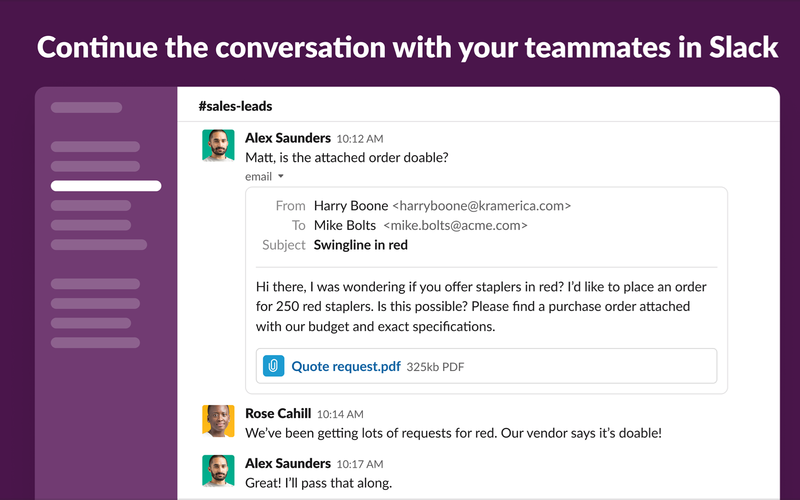 Send it into Slack where you can discuss quickly and move forward. * Have an idea you want to share with your team? Send it along to a relevant channel with a note about your insights. * Start by installing the Slack for Outlook Add-In from the Microsoft AppSource. 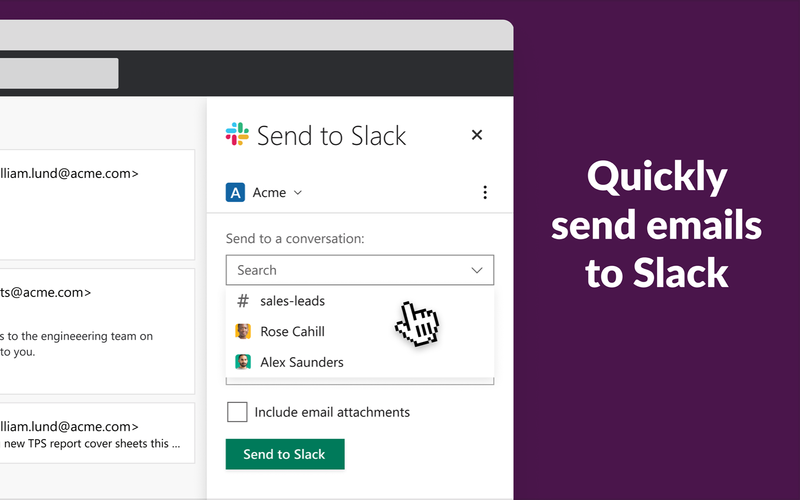 * Open any email and click on the slack icon in the right-hand side of your inbox. * Choose the channel or person you’d like to forward the email to inside of Slack. * Add a message and include attachments if you’d like. 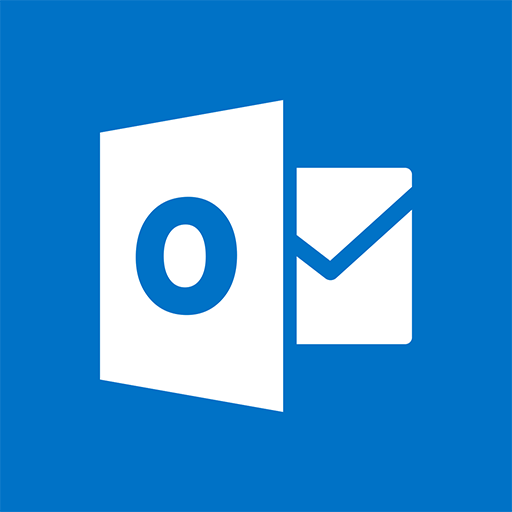 * Slack for Outlook works with most versions of Outlook that allow add-ins for Office: Outlook Web App and Office 2016 for Windows, Mac, iOS, and Android. * You must have an Slack account and an Office 365 Commercial subscription to use this add-in. On-premises Exchange Server is not supported. Slack for Outlook will be able to manage emails on your behalf in the workspace. 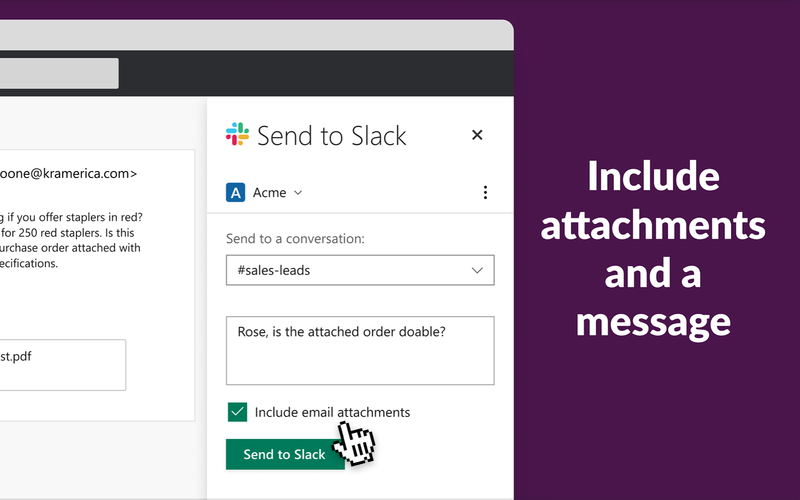 Slack for Outlook will be able to modify the unread status of your direct messages. Slack for Outlook will be able to access information about your workspace, including name, email domain, and icon. Slack for Outlook will be able to access your profile fields, as well as any data you’ve entered in them. Slack for Outlook will be able to access basic information about your public channels (including names, topics, purposes, creation date, and latest message). Slack for Outlook will be able to access basic information about your private channels (including names, topics, purposes, creation date, and latest message). Slack for Outlook will be able to access basic information about your direct messages (including names, topics, purposes, and creation date). Slack for Outlook will be able to access basic information about your group messages (including names, topics, purposes, and creation date).